This is mostly in order of what you stumble upon first, but not really. This of course was the first thing you saw when you stepped on the porch. It is an awesome round-top door with a half circle lite. It was painted orange at the time, and really not a good orange. I love orange, and even I couldn't wait to paint the door! 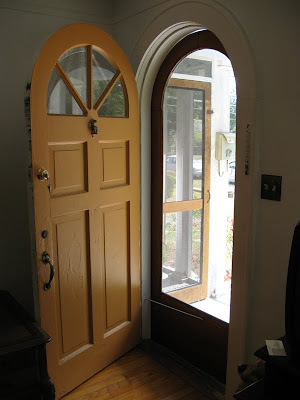 The storm door, which is also awesome, was probably custom-made to fit the round top frame and it has a full-height window with no obstructions. Another small feature of the front door was the reindeer door knocker, which had me believing that fate was 'knocking on our door' (pun intended). You see, I collect reindeer, so it was destiny! 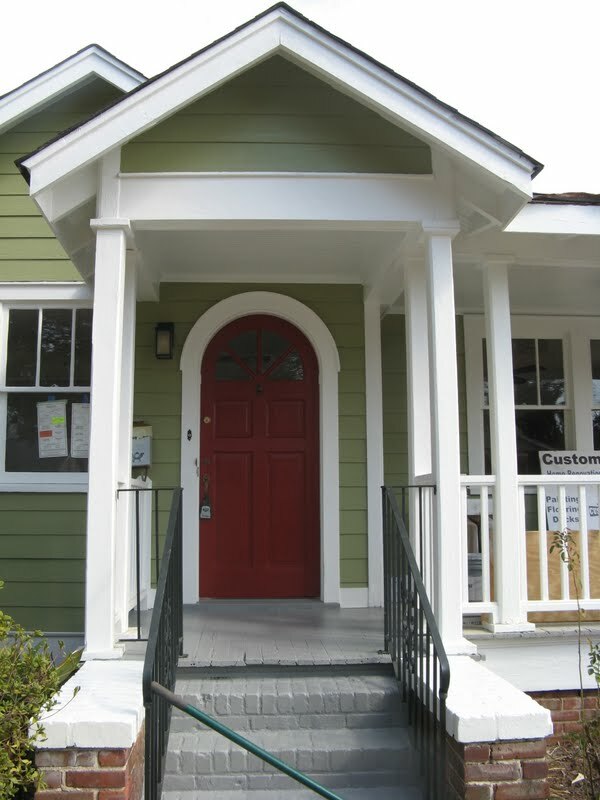 One of the most charming features of the house hits you when you walk in the front door. 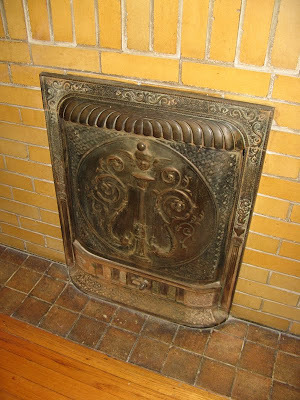 The fireplace is an unusual mustard-color glazed brick with an interesting pattern that extrudes in and out. The fireplace also has an antique cast-iron insert and cover with an angel motif that is stunning. A funny story about that is that when we made the offer on the house, the executors of the estate hired an 'estate sales company' to come in and organize all of the personal belongings to be sold. They were very nice and even let us come in while that were setting up to go through old photos, and actually said that if we found any pictures of the house then we could keep them (which we did). Well, the day before the sale is set to start, they post photos of the items that will be sold on their website. 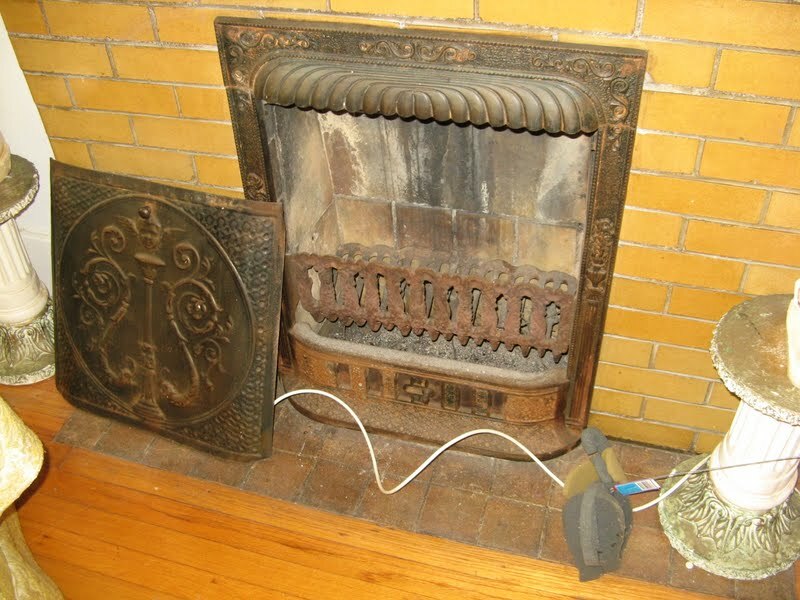 So I decided to peruse the furniture, clothing, dishes, etc that would be sold, and lo & behold the fireplace cover was posted! Immediately I called our realtor and had a screaming fit! Tears, the whole nine yards. It was not pretty. This went around and around between us, the realtor, the sale company, the estate, etc. The sale company's policy is that they sell anything that isn't part of the house, so if you can pick the house up and turn it upside down, then they can sell anything that would fall out. Well, well, well... my argument was that the insert that the screen latched to, was clearly not falling out, and that they best be putting that piece back on my fireplace. It actually took a little more encouraging than that, but clearly this was original to the house, and it wasn't going ANYWHERE. It was pretty much an 'over-my-dead-body' scenario. Point being, it stayed. clearly the cover goes with the insert!? There are two antique concrete flower boxes that flank the front stairs, and they are actually in that same location in some photos we found dated 1968, but like the fireplace screen above, they shook out in the turn-the-house-upside-down trick. I wasn't convincing them to let us keep them, especially after the fireplace debacle. So, we paid for them. I can't remember if they were $25 a piece or $25 for the pair, but whatever it was, they were worth it! I mean really, the house would look naked. Now if I could only keep the flowers alive. The following photos give you an idea of what the house looked like when they took the planters off to paint (notice the red door, sans storm door), then the planters in full bloom on the right. See what I mean about naked?! Since I've told you some of the bad that came out of the estate sale, I'll share a good story... we knew that there had been an elderly African American woman living in the house since she purchased it in 1968 (Miss Julia), and we knew that the house had been built around 1935 according to the tax maps. What we didn't know was who built the house and lived in for those other 33 years? Well, the young guy who owned the Estate Sale business is Jewish, and he pointed out this small rectangular containers on the front door and bedroom doors that I never would have noticed! They are decorative cases that hold parchment called mezuzah, a prayer scrolled inside. History says these should be placed on all doorways (except bathrooms & closets), and that they protect the inhabitants inside the rooms. Needless to say, we didn't remove them, but unfortunately they had been painted over so many times that they are pretty unrecognizable, and we aren't sure if the prayers have survived. We figured it was best to leave them be! I'll have to find a photo! The floors are also quite unique in color, and they were one of the first things that I latched onto. They were in great condition and one of the few things that I knew we wouldn't have to do much to. Of course the contractor didn't protect them like they should have, so a light sanding was necessary after construction, but not on our dime. One of the first things I did after the closing was scrub these floors and ever since I've had a strong connection with them! 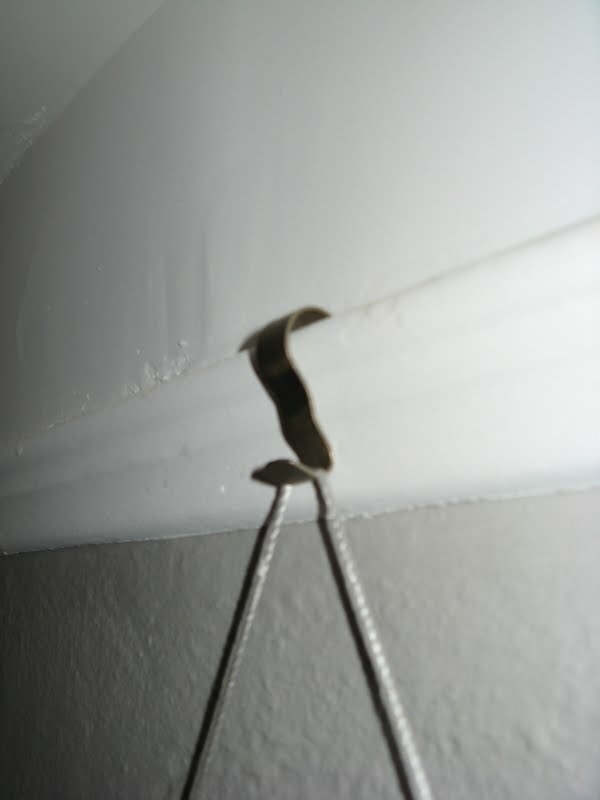 When we first bought the house, the ding in our ding-dong didn't work. The electrician tried to fix it, and it worked for a while, but we are back to 40% of the time or so. It's still cool to look at though! 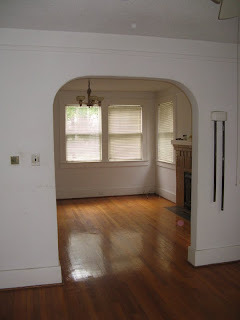 See hardwood floor photo above. 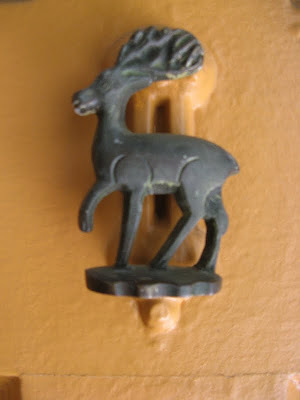 If you are still reading, you've probably read this post in the past, where I go on and on about the picture rail, and the practicality & beauty that surrounds it. That about sums it up! Can you tell that I'm getting lazy? This one post has taken me over a week to write. 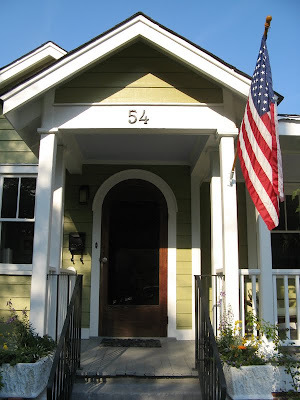 As excited as I am about our house, and all of it's cool parts, this is getting ridiculous. Maybe I should have stopped at 5? I just recently wrote about the phone nook as well, over here. Regardless, it is way cool, and it took me a long time to decide what to put in it, so I painted it, and added a flower, but I'm sure this will be an ever-changing display for holiday decor of the moment, etc. I love our bathroom. 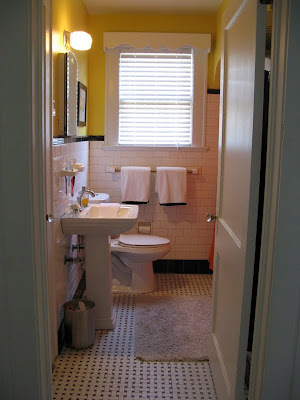 In fact, I probably could have written a post about "The 5 things I love about our bathroom". So here goes, a post within a post. 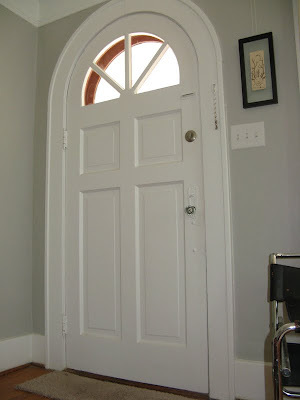 The wooden built-in valance over the window. It was there when we moved in, but it blended into the white walls, and there were green, flow-y curtains billowing over vinyl mini-blinds. The wall tiles & floor tiles. 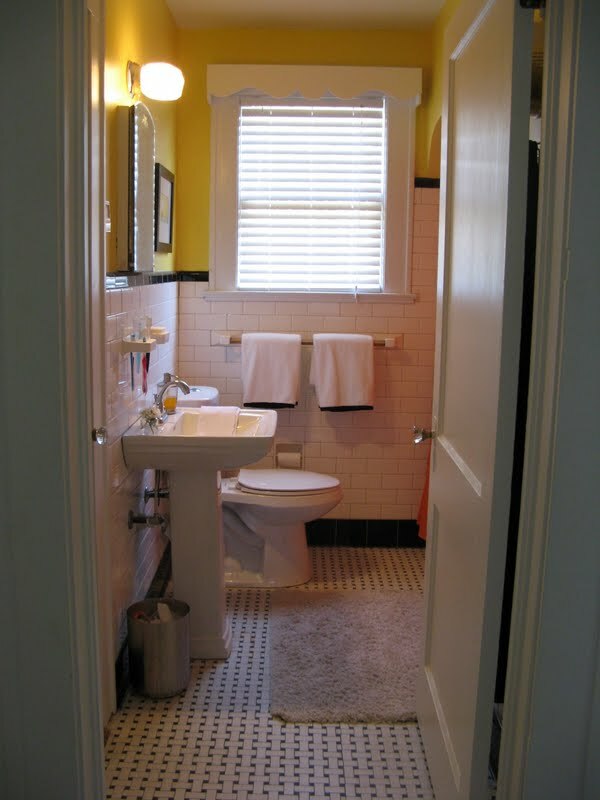 White subway tiles with a black border on the walls, and a black and white basketweave on the floor. These tiles are gorgeous, and I love them. Again, when the walls were painted white, the tiles blended in, but now with the more vibrant color on the walls, they pop! The floor took some work, since there was a lot of rust that needed to be scrubbed. Read more about that here. 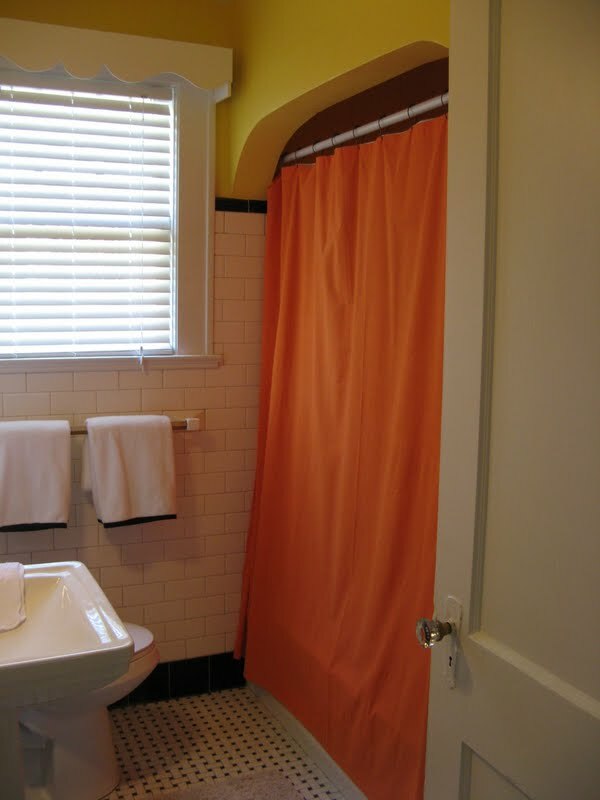 The archway over the tub. 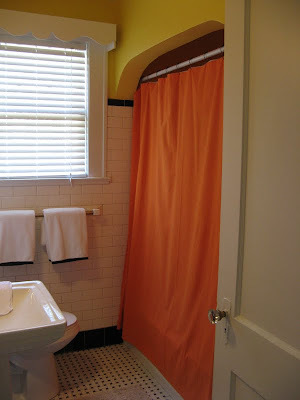 Before it got lost in the white walls, and it too had a green shower curtain coming from it, but the arch is truly highlighted with the yellow on the wall and the bright orange shower curtain! 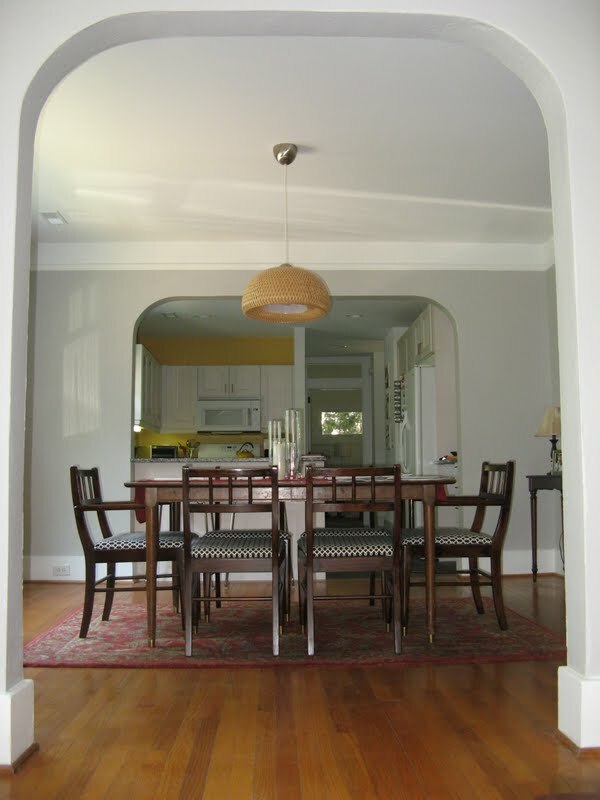 This arch is quite similar to the other archways in the home, but I love that it is in such a small space, adding so much character! The cast iron tub. I love that the tub is in keeping with the age of the home. Also, it is quite deep and large considering it's age. It did have 1970's flower power stickers for slip-resistance that had probably been there since the 70's, but when we had the tub reglazed, those went by the wayside, thankfully! All the little things. The light fixture is a replica of the one that was there. The original no longer worked and therefore we replaced the whole thing. 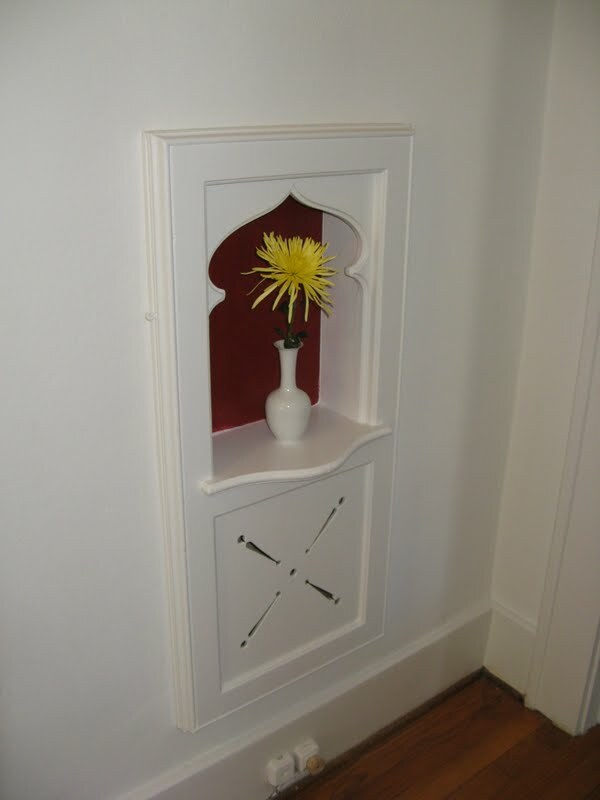 The medicine cabinet & mirror... yes, it's old-school, but it is also super-awesome. A little worn, but definitely functional. Soapdish/toothbrush holder/towel rod tiles... yes, these are all tiles that have survived the duration of the life of this house so far. I love that each of these things was integrated into the original bathroom layout. So there you have it, the post-within-a-post = one happy bathroom. This is something that we went around and around about. 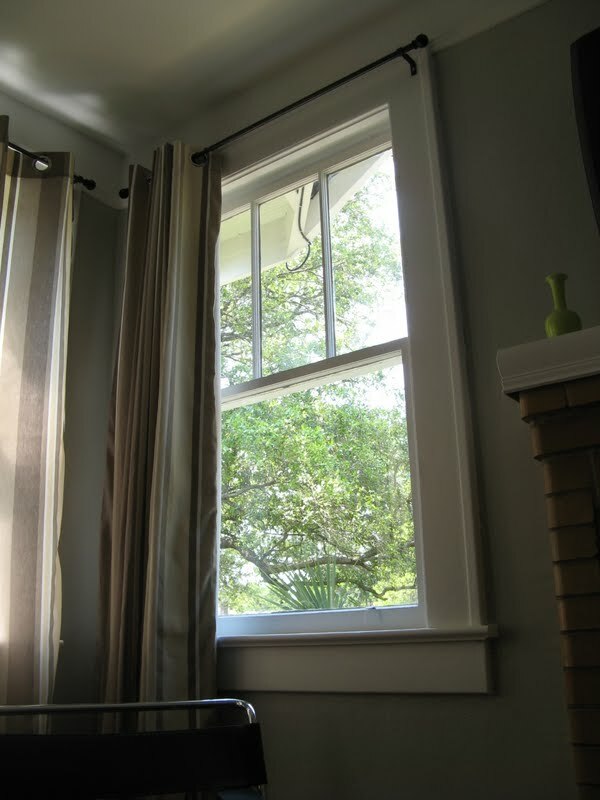 Do we replace the windows, thus making the house more efficient, or not. We went with not. There is just something so charming about those darn original windows. We just couldn't part with them, and it would have been extremely expensive to replace them with models that looked like the original, so we didn't budge. You may remember that the new window in our Master Bedroom mimics the old ones. And there it is, the 11 original features I love about our house. Really it was more like 20 things, if you separate out all the bathroom features, etc, but who's counting, right? Can you tell that I was sitting on the living room floor when I took several of the photos in this post?